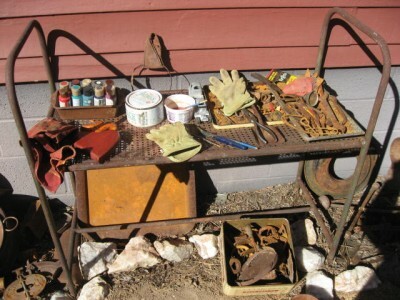 My studio isn’t heated, so in the winter I work outside in the sun on warmish days. Visit Rebecca for more Postcards from Paradise @ http://corazon.typepad.com/. ~ by Dawn Elliott on February 16, 2013.
i am so thrilled at the prospect of Spring this year! i want to throw open all the windows and paint outside. i want to relish each colour and bud returning to our landscape. i am filled with the anticipation of daffodils and narcissus, the first tiny peek of green tendrils of morning glories and clematis. renewal. rebirth. i am ready and willing! Days of beauty to look forward to all bright and sunny and cheerful. We just have snow drops here at the moment, before too long it will be ablaze with colour, paradise returned. One of the blessings of AZ (in the winter, at least) is the sun. Not many places you can work outdoors in Jan/Feb! Glorious daffodils! True heralds of spring–and paradise! 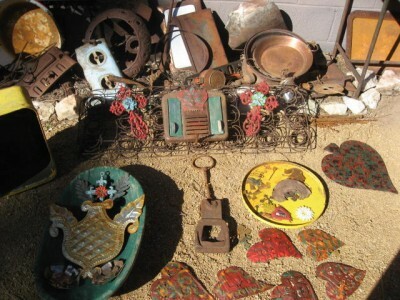 Love all of the rusted ephemera…and daffodil sprouts. I want Spring to hurry. Even though our FL winter was mostly warm, I am ready for the real thing. 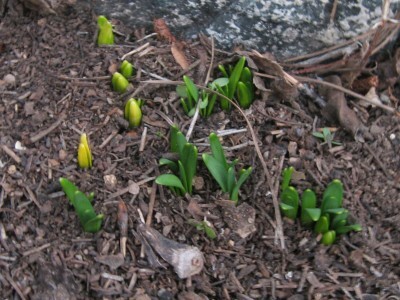 Your daffodils are encouraging.